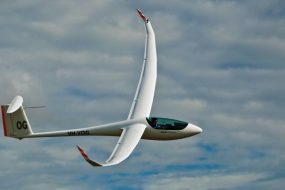 Home / Gliding FAQ / What is a glider? A glider, often referred to as a sailplane, is an aircraft designed to fly without an engine. It’s always worth remembering that the Space Shuttle was a glider. And the military have used gliders to land troops. But the space shuttle and military gliders are not sailplanes. They are not designed for sustained soaring flight. So when we talk about gliders we are normally referring to sailplanes. Gliding predates powered flight. Otto Lilienthal was a German pioneer of aviation. He was the first person to make well-documented, repeated, successful flights with gliders in the mid 1800s. The Wright brothers also built and flew gliders before their first powered flights in the early 1900s. Today, gliding is typically a ‘club’ activity. Gliders are flown from gliding club airfields although some gliding clubs are based on a normal airfield and share it with powered light aircraft. Modern gliders are generally very efficient aircraft; technically advanced, strong but relatively light compared to a powered plane. A glider needs help to get into the air. This is usually either by being towed into the air by a powered plane or ‘kited’ up using a powerful winch. At Talgarth we only use the aero-tow method. Some clubs that are located on the top of ridges or hills, such as The Midland Gliding Club at The Long Mynd in Shropshire, occasionally ‘bungee’ launch off their ridge. 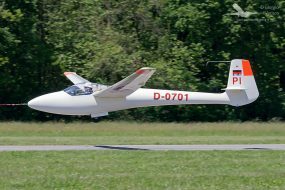 Some gliders are also able to self-launch using a small built in engine. The engine may be retractable or embedded in the glider but with a retractable propeller. Once launched, gliders are able to stay airborne by using rising currents of air. Glider pilots use the term ‘lift’ to describe areas of rising air. Thermals and wind being deflected upwards by mountain ridges are the most common form of lift used by pilots to stay in the air. There are different types of glider being flown today. Historic/classic gliders, made from wood and fabric, from the 30s/40s/50s are popular and have a unique charm and enthusiastic following. Many of the first generation of glass fibre gliders, from the 60s/70s are still flying and are popular with pilots with a mid-range budget. The modern crop of glass and carbon fibre gliders are precision performance aircraft. They are fine-tuned and equipped with an array of high tech instruments to help get the most from their performance. In the right hands they fly huge distances and at surprisingly high average speeds. 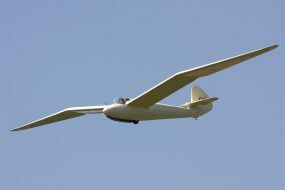 Most gliders have a wingspan of between 13m and 20m, with 15m being the most common. There are larger gliders – most clubs will have a member or two with something around the 23m size – and there are some quite exotic gliders with wingspans over 28m. Larger gliders are often two-seaters. With the right weather conditions gliders can fly for hours and cover hundreds of miles. 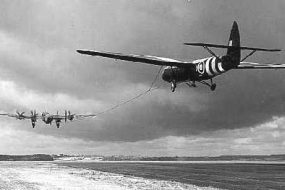 The usual aim is to return to the home airfield. Sometimes it isn’t possible to complete a flight so an outlanding at another airfield or a farmers field is something glider pilots are well prepared for. A lot of gliders are now fitted with small auxiliary motors. These are not powerful enough to enable to glider to take off under power but are able to sustain flight and get them home. These motors are typically small internal combustion engines although small turbo-jets and electric systems are becoming popular. Gliders are flown both recreationally and in competitions. Just about anyone can learn to fly a glider. In the UK the minimum age for solo flying is 14 but young people can start learning earlier.